In the suburbs of Washington, D.C. in the mid-1980s, 13-year-old Franklin Robertson is trying to survive. His parents don't understand him. His older brother torments him non-stop. He'd rather write stories than go on dates. His great comfort comes from the horror movies he watches every Saturday night at midnight, on a black-and-white TV set in his basement, introduced by the enigmatic Dr. Cerberus. In fact, Franklin feels certain that Dr. Cerberus can save his misfit life—if only Franklin could get on his show. A coming-of-age comedy with a twist of terror, Doctor Cerberus is the latest from this "intelligent, compassionate writer" (Variety). 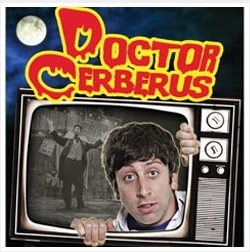 In 2013, L.A. Theatre Works released "Dr. Cerberus," among other plays, as audio books app, available as Android Apps on Google Play and on the iTunes App Store. The app includes biographies of the cast and the author, summary of the play, gallery, historical background information, Word search games. The audiobook is available to purchase at various stores such as amazon.com. A coming-of-age cocktail with a twist of horror! Thirteen-year-old Franklin Robertson is trying to survive adolescence. His parents don't understand him, and he's more interested in the high-school quarterback than any girl. Franklin's only refuge is to immerse himself in late-night B-movies, hosted by the creepy and corny Doctor Cerberus. But when reality begins to intrude on his fantasy world, he realizes that hiding in the closet is no longer an option. At L.A. Theatre Works website Steven's radio play "Dr. Cerberus" is available to listen to. A teenage misfit is coming of age in the comforting glow of late-night horror movies. But when reality begins to intrude on his fantasy world, he realizes that hiding in the closet is no longer an option. 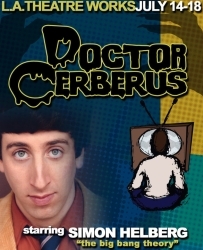 Beginning Saturday, January 15, L.A. Theatre Works' Radio Theatre Series will air "Dr. Cerberus" by Roberto Aguirre-Sacasa, starring Simon Helberg, Pamela J. Gray, Steven Culp, Jarrett Sleeper, and Jamison Jones. The broadcast can be heard locally in Southern California on Saturday from 10 pm to midnight on 89.3 KPCC, and can also be streamed on demand at http://www.latw.org/. Simon Helberg (The Big Bang Theory) stars as a teenage misfit coming of age in the comforting glow of late-night horror movies. But when reality begins to intrude on his fantasy world, he realizes that hiding in the closet is no longer an option. L.A. Theatre Works' radio theater series can also be heard on the following stations (check local listings for broadcast times): 89.7 WGBH, Boston; 91.5 WBEZ, Chicago; 94.9 KUOW, Seattle; 90.1 WABE, Atlanta; 94.1 KPFA, Berkeley; 91.1 KRCB, North Bay (San Francisco); and in over 100 other markets nationwide. Major funding for L.A. Theatre Works broadcast series is provided by the S. Mark Taper Foundation. Founded in 1989, the S. Mark Taper Foundation is a private family foundation dedicated to enhancing the quality of people's lives by supporting non-profit organizations and their work in the community. 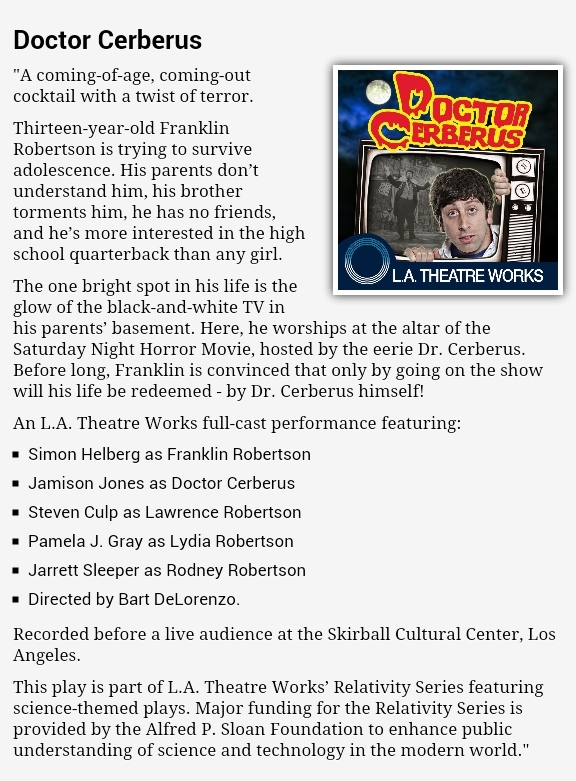 The abridged version of the play will also be made available for listening online at the L.A. Theatre Works website. 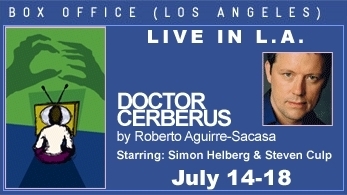 The L.A. Theatre Works production of Roberto Aguirre-Sacasa's Doctor Cerberus, a coming-of-age tale with a dark twist, begins performances July 14 at the Skirball Center. 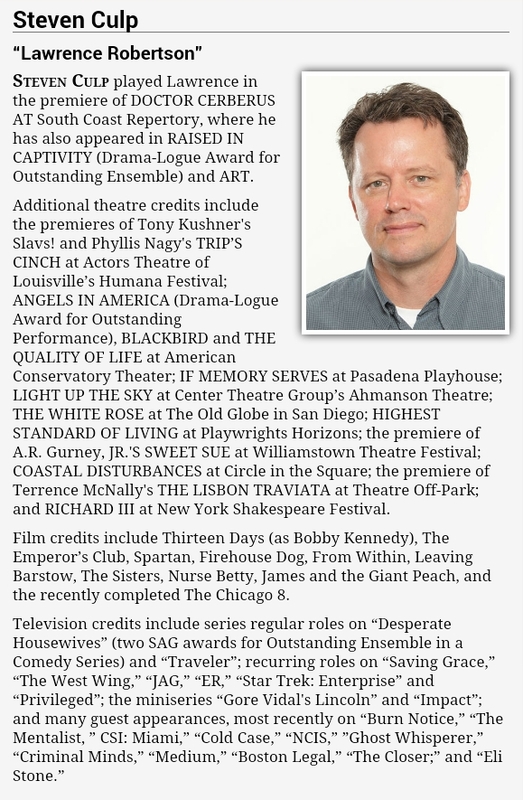 Bart DeLorenzo, who directed the world premiere of the play at South Coast Repertory in April 2010, again helms the LATW run that will continue through July 18. Simon Helberg ("The Big Bang Theory") stars as young teen Franklin Robertson, with original cast members Steven Culp and Jarrett Sleeper reprising the roles of Franklin's dad and brother, respectively. Original cast member Jamison Jones again appears in the title role with Pamela J. Gray as Franklin's mom. According to LATW, "Thirteen-year-old Franklin Robertson is trying to survive adolescence. His parents don't understand him, his brother torments him, he has no friends, and he's more interested in the high school quarterback than any girl. The one bright spot in his life is the glow of the black-and-white TV in his parents' basement. Here, he worships at the altar of the Saturday Night Horror Movie, hosted by the eerie Dr. Cerberus. Before long, Franklin is convinced that only by going on the show will his life be redeemed - by Dr. Cerberus himself!" Aguirre-Sacasa is currently represented with his revised production of the 1966 musical It's a Bird...It's a Plane...It's Superman, which is now premiering at the Dallas Theater Center. He has also penned the plays Good Boys and True, Based on a Totally True Story, The Mystery Plays and The Muckle Man. Doctor Cerberus will be recorded and broadcast on LATW's nationally syndicated radio theatre series, "The Play's the Thing." Pamela J. Gray and Jamison Jones have joined the L.A. Theatre Works production of Roberto Aguirre-Sacasa's black comedy Doctor Cerberus, which will begin performances July 14 at the Skirball Center. Jones, who appeared in the world premiere of the coming-of-age tale, will reprise his performance in the title role. The cast features the previously announced Simon Helberg as Franklin Robertson, Steven Culp as Franklin's dad and Jarrett Sleeper as Franklin's brother. 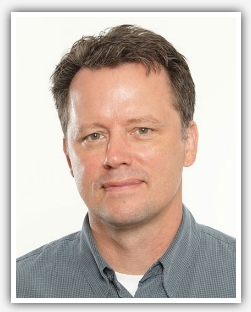 Gray will play the teen's mother. Pamela J. Gray and Jamison Jones will join the previously announced Steven Culp, Simon Helberg, and Jarrett Sleeper in Los Angeles Theatre Works' presentation of Roberto Aguirre-Sacasa's Dr. Cerberus, to be presented July 14-18 as part of their "The Play's The Thing" radio series at the Skirball Cultural Center. Set in the suburbs of Washington, D.C., in the mid-1980s, the play is a coming-of-age story about a geeky, overweight teenager who finds comfort in the horror movies he watches every Saturday at midnight on a black-and-white TV set in his basement. The films are introduced by the enigmatic Doctor Cerberus, and the teen dreams of becoming the TV host's assistant. DOCTOR CERBERUS is written by Roberto Aguirre-Sacasa and directed by Bart DeLorenzo. It stars Simon Helberg, Steven Culp, and Jarrett Sleeper, and is produced by Susan Albert Loewenberg. L.A. THEATRE WORKS is located at the Skirball Cultural Center, 2701 N. Sepulveda Blvd., Los Angeles, CA 90049. Tickets may be purchased at L.A. Theatre Works Box Office (310) 827-0889 or www.latw.org. Tickets are $20.00 to $48.00. 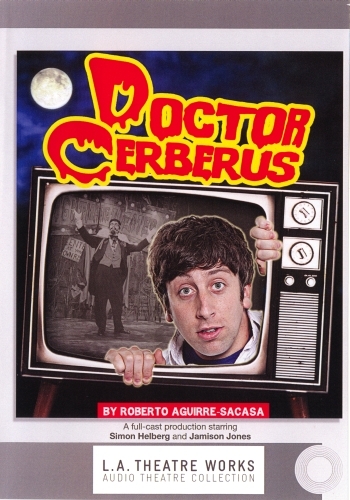 Steven Culp, Simon Helberg, and Jarrett Sleeper are set to appear in Los Angeles Theatre Works' presentation of Roberto Aguirre-Sacasa's Dr. Cerberus, to be presented July 14-18 as part of their "The Play's The Thing" radio series at the Skirball Cultural Center. Bart DeLorenzo will direct the presentation, which, as previously reported, was to have featured Adam Arkin and JoBeth Williams, who have had to withdraw. Set in the suburbs of Washington, D.C., in the mid-1980s, the play is a coming-of-age story about a geeky, overweight teenager who finds comfort in the horror movies he watches every Saturday at midnight on a black-and-white TV set in his basement. The films are introduced by the enigmatic Doctor Cerberus, and the teen dreams of becoming the TV host's assistant. Additional casting will be announced shortly. 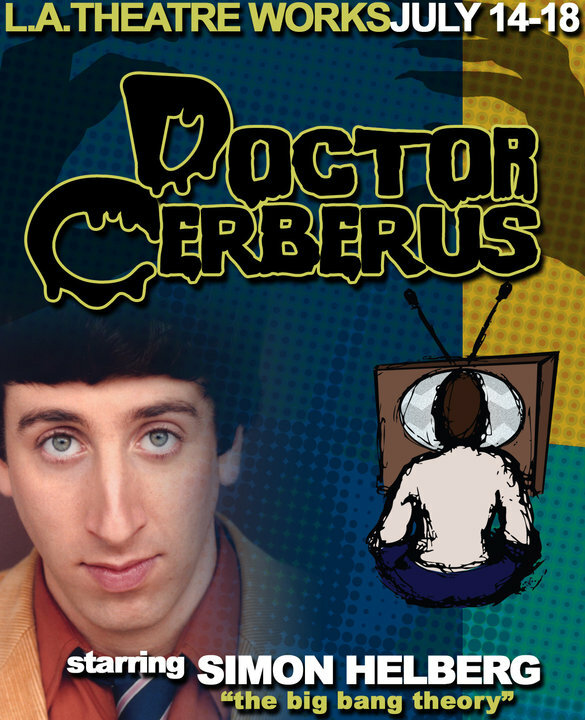 "The Big Bang Theory" actor Simon Helberg will star in Roberto Aguirre-Sacasa's Doctor Cerberus, a coming-of-age tale with a dark twist, for L.A. Theatre Works beginning July 14. Bart DeLorenzo, who directed the world premiere of the play at South Coast Repertory in April 2010, will again helm the LATW run that reunites several cast members from that production. Performances will continue through July 18. Helberg will step into the role of Franklin Robertson, with Steven Culp and Jarrett Sleeper reprising the roles of Franklin's dad and brother, respectively. Additional casting will be revealed shortly. According to LATW: "Thirteen-year-old Franklin Robertson is trying to survive adolescence. His parents don't understand him, his brother torments him, he has no friends, and he's more interested in the high school quarterback than any girl. The one bright spot in his life is the glow of the black-and-white TV in his parents' basement. Here, he worships at the altar of the Saturday Night Horror Movie, hosted by the eerie Dr. Cerberus. Before long, Franklin is convinced that only by going on the show will his life be redeemed - by Dr. Cerberus himself!"